BASC will be participating in the 2018 "Night out against Crime & Fun & Games On Main" event! This community event will be held on Main Street in Broken Arrow on Saturday, Oct. 27th from 6PM - 8PM. What is Fun & Games On Main? This is a community party in Broken Arrow that will begin on Saturday, October 27th; between 6:00PM - 8:00PM. There are attractions and family entertainment geared for children and parents who want to bring the entire family to participate. 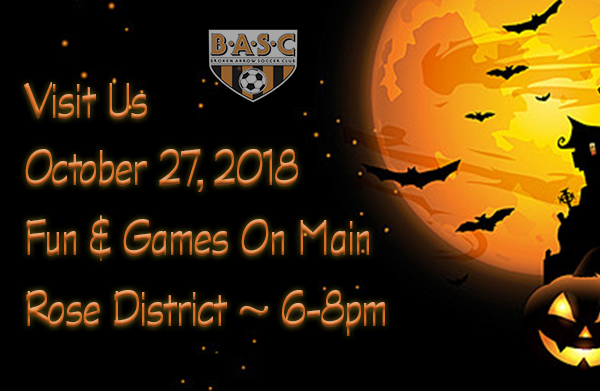 Stop by the BA Soccer Club booth to take photos with our props, eat some treats and enjoy a fun filled evening with your family!